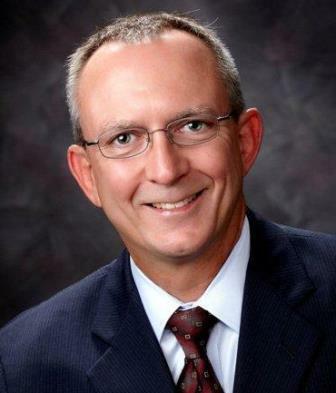 AAGP to meet in March in Orlando, Fla. The speakers are lined up, the PowerPoints are ready, and committee meetings are scheduled for the association's 2014 Annual Meeting, March 14-17 at the Renaissance Orlando at SeaWorld. The conference will offer participants four days of educational sessions, networking opportunities, and many chances to become more involved in the association. AAGP committee, caucus and interest group meetings are open to all. Meet others and network in a relaxed atmosphere during the Opening Reception and exhibit hall receptions. Don't pay more than you have to! Registration fees for the AAGP 2014 Annual Meeting increase soon, so register now to save $70-80 on full registration, $50 on one-day registration, and $25-50 on workshop fees. Register at www.AAGPmeeting.org. Late-breaking poster submissions due: To provide Annual Meeting participants with the latest research, AAGP has reserved slots for a limited number of late-breaking research posters. Late-breaking abstracts describe important current research advances that have not been submitted previously. Learn more at www.AAGPonline.org/2014CFP. Last day for early-bird, Annual Meeting discounts. Last day for special hotel rate: The Renaissance Orlando at SeaWorld is offering a special rate for meeting attendees. Reserve early before rooms fill up. The special rate is only available through Feb. 5. Learn more at www.AAGPonline.org/hotel. In early December, both the House of Representatives and the Senate moved toward eliminating an annual budgetary headache by crafting legislation to repeal the 1997 Medicare physician payment formula that has periodically threatened to reduce Medicare payments to providers. The draft framework would move providers toward payment systems that provide incentives for quality rather than for volume. Under the new system, providers could get bonuses under a consolidated value-based program depending on how they scored on certain performance factors. The system would also promote alternative payment models, such as accountable care organizations, by providing bonuses to doctors who get a significant portion of the revenue through a model that involves financial risk. On Dec. 12, the House Ways and Means Committee and the Senate Finance Committee approved legislation that would repeal the Medicare Sustainable Growth Rate formula used to calculate payments for physicians who treat Medicare beneficiaries, and replace it with a new system of incentivized payments that reward physicians for providing high quality care. The House Energy and Commerce Committee, which also has jurisdiction over the Medicare program, approved its version of SGR reform legislation in July. In all three versions of the legislation currently before Congress, replacing the SGR formula would be a new value-based performance program that attempts to better align Medicare physician payments with medical outcomes, moving away from the current fee-for-service system, which has rewarded volume over quality since its inception. Park Ridge Health, in beautiful Western North Carolina, provides quality, compassionate care in a Christian environment. We are searching for a Psychiatrist to join our Behavioral Health team. Job includes in-patient and out-patient duties in a 36 bed department with med-psych, gero-psych, and a women’s unit. Click here to apply. So, after a year of some confusion and having to live with interim values for our codes, from which Medicare physician payments are derived, we now enter 2014 with codes that have increased as well as more correct values. The Center for Medicare and Medicaid Services accepted all of the American Medical Association's RBRVS Update Committee Relative Value Units values for the new codes. In 2013 we were provided with interim values by CMS. Many of you may recall how this even led to the odd circumstance where the evaluation code without medical services (90791) was valued higher than the same code with medical services (90792). With the new values this discrepancy no longer exists with the correct value of 90792 being greater than 90791 (see this chart). It is hoped that in 2013 you coded for the service provided (presumably 90792 if you are a psychiatrist or psychiatric nurse practitioner) even though the payment was less. 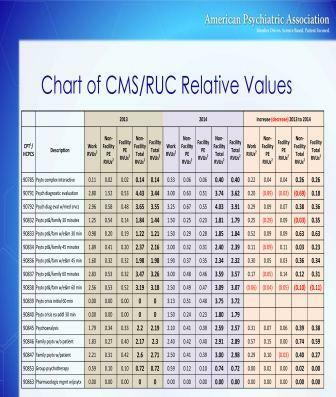 Values for all of our codes went up substantially given the fact that we were given interim values in 2013. This chart summarizes these changes that went into effect Jan. 1. In a CMS News release on Nov. 27, CMS stated, "The 2014 payment rates increase payments for many medical specialties with some of the greatest increases going to providers of mental health services including psychiatry, clinical psychologists and clinical social workers." Medical specialties have had a difficult time proving the need for higher values at the RUC over recent years. We owe a lot of credit to the American Psychiatric Association for leading the charge on this. Both psychiatrist volunteers from the RBRVS Committee and APA staff put significant effort into the work of creating new codes, including add-on codes for psychotherapy, sending out and analyzing surveys, and then presenting the new codes to the RUC. We were able to provide compelling evidence to obtain the improved values that were then accepted by CMS. The new coding system certainly aligns well with the practice of geriatric psychiatry. It has been a bit more problematic for other psychiatrists, particularly outpatient psychiatrists who provide significant psychotherapy to patients. Given our specialty’s approach with a more significant connection to medical issues, the new system proves to be more user friendly. 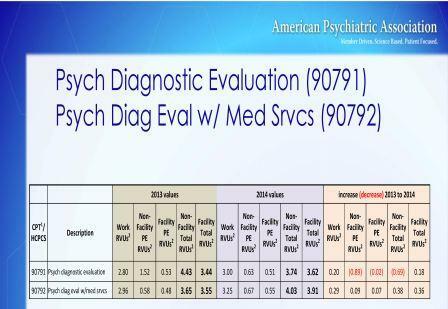 In fact many geriatric psychiatrists were already regularly using Evaluation and Management CPT codes that generally provide better RVU values compared to the prior psychiatric CPT codes. The other benefit of the new system is the ability to combine the medical evaluation with psychotherapy and obtain a total value well above what was available prior to 2013 when we had very little added value for E&M services. Still Medicare payments in general are often below most other insurance payers with the exception of Medicaid in most areas. This is unlikely to change much in the future with great pressure to reduce Medicare expenditures. There has been a bipartisan and bicameral agreement to "fix" the SGR. However such a fix might include a freeze on Medicare payments for perhaps as long as 10 years. So, it is vital to keep up to date on this and other coding issues. There will be several presentations on coding issues at the upcoming AAGP Annual Meeting. Hope to see many of you in Orlando. Allan A. Anderson, MD, of Easton, Md., serves on the RBRVS Committee of the American Psychiatric Association and is the alternate representative from the APA to the American Medical Association RBRVS Update Committee. Lawrence Lazarus, MD, a past president of the American Association for Geriatric Psychiatry, has just published "Getting the Health Care You Deserve in America's Broken Health Care System." 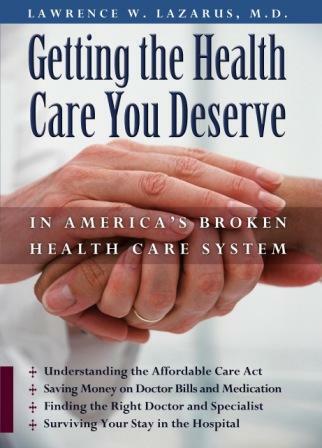 Written for psychiatrists, other physicians and the lay public, the book covers the many problems patients face obtaining psychiatric and medical care because of escalating costs, fragmentation rather than coordination of health care, and the increasing shortage of physicians, especially when millions of uninsured Americans obtain insurance in 2014 under the Affordable Care Act, Obamacare. Practical advice is given on how Americans can take full advantage of the ACA, strategies for reducing health care costs, selecting and keeping the best primary care physician and specialist (e.g., psychiatrist), and surviving a stay in the hospital. Dr. Lazarus shares his 40 years of experience in psychiatric practice using clinical vignettes to demonstrate ways to help patients overcome their resistance to psychiatric and medical treatment plans, the importance of having a designated health care advocate, and addressing end-of-life issues (of special importance for the elderly). Profits will be donated to the LaFamilia Medical Center, a non-profit facility serving the poor in Santa Fe, N.M. Dr. Lazarus maintains a part-time psychiatric practice in Santa Fe. Send feedback/comments about the book to larry@lwlazarus.com. If you have professional news such as a move, new responsibilities, or award that you would like to share, please write to kmcduffie@aagponline.org. If you are interested in attending the conference you can register at www.AAGPonline.org/register. Early-bird Registration (lowest rates) ends Jan. 23. Hotel reservations are due Feb. 5. Pre-registration ends Feb. 20. Want to find a roommate to share hotel costs? Many students and trainees prefer to share hotel rooms to reduce hotel costs for the meeting. AAGP will assist students and residents by providing a contact list of those interested in this option. It is then the responsibility of those on the list to contact one another and make arrangements and hotel reservations. If you would like to be included on the list, email kmcduffie@aagponline.org. At the end of December, the U.S. Department of Health & Human Services Office of the Inspector General and the Centers for Medicare and Medicaid Services published companion rules which extend the ability for physicians to accept donations of almost free (must pay at least 15 percent of the cost of the technology) electronic health records from certain health care entities without violating STARK and Anti-kickback rules. The exception/safe harbor, scheduled to sunset on Dec. 31, 2013, was extended to Dec. 31, 2021. The rule also: excludes laboratory companies from the types of entities that may donate electronic health records items and services, updates the provision under which electronic health records software is deemed interoperable, removes the electronic prescribing capability requirement, and clarifies the requirement prohibiting any action that limits or restricts the use, compatibility, or interoperability of donated items or services. The CMS rule: http://www.gpo.gov/fdsys/pkg/FR-2013-12-27/pdf/2013-30923.pdf. The OIG rule: http://oig.hhs.gov/authorities/docs/2013/2013-30924.pdf. NIA released a set of program announcements called "Advancing the Science of Geriatric Palliative Care," seeking applications using R01, R03, or R21 mechanisms. These PAs highlight to the scientific community NIA's interest in promoting research at the intersection of two disciplines — geriatrics and palliative care — that share many of the same approaches to clinical care. The National Center for Complementary and Alternative Medicine and the National Institute of Nursing Research are also sponsors. A more intensive exercise program specifically designed for people in hospital with dementia has been shown to add benefits over normal rehabilitation, say researchers set to publish their findings in a February 2014 issue of the Journal of Alzheimer's Disease. Earlier this month, Alzheimer's Disease International, a federation of advocacy and research organizations, released a policy brief which reports a 17 percent increase in the number of people living with dementia, compared to the original ADI estimates in the 2009 World Alzheimer Report. Merck & Co. is putting the prevailing theory on the cause of Alzheimer’s to a test with two studies in thousands of people that may, once and for all, determine whether the amyloid tangles that grow in the brain spur the disease or are simply an outgrowth. Depression is alarmingly common in older Americans. It’s highly treatable, but a number of obstacles, led by a nagging generational stigma surrounding mental health, often stand in the way of proper care. About 20 percent of people ages 55 and older experience mental health concerns, federal data show. And depression, by far the most common condition, is treatable in 80 percent of cases. Childhood music lessons could pay off in protecting the brain against dementia decades later, even in those who don't continue to play, researchers are learning. In one study, children who played instruments performed better on memory tests even decades later. A simple 15-minute test which can be taken at home can spot the early signs of Alzheimer's disease, researchers claim. The exam, which can be completed online or by hand, tests language ability, reasoning, problem solving skills and memory.